The following topic describes all visual elements and terms used in a standard RadBulletGraph control. Label: Visual representation of a value on the scale. Tick: Indicates the position of specific values on the scale. FeaturedMeasure: Represents the current progress in a RadBulletGraph. FeaturedMeasureAlternative: Indicates the EndValue of the Featured Measure. It is an Ellipse by default. 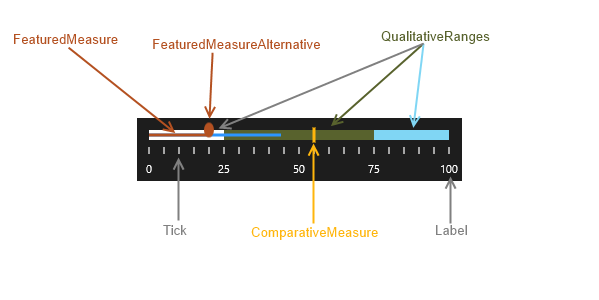 ProjectedMeasure: Indicator that starts from the EndValue of the FeaturedMeasure. Comparative Measure: Marker indicating a certain threshold or value in the context of the data displayed. Qualitative Ranges: Different colored ranges, usually indicating bad, satisfactory and good areas.